American-style biscuits are a perfect snack. The addition of the sweet potatoes in this recipe adds flavor and nutrition – after all, sweet potatoes are a super food, which means that they have a high nutrient to calorie ratio. 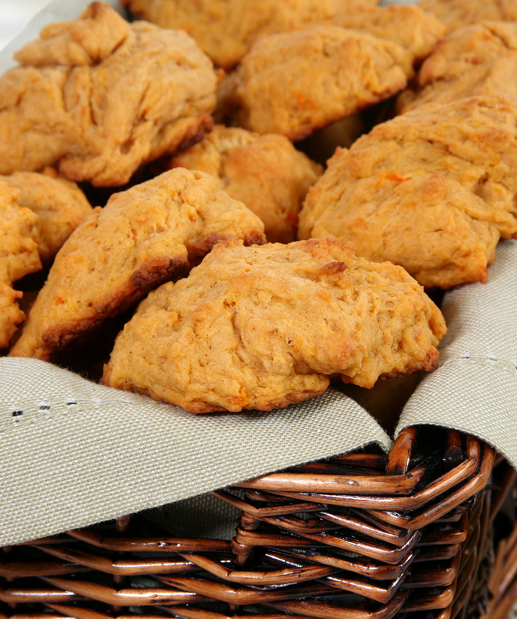 These biscuits can also be served as part of a main meal. If you’re out of sweet potatoes you can use any kind of sweet squash. Pumpkin (even canned if you’re in a hurry) is a great substitute. 2. Combine the flours, baking powder and salt in a medium-sized mixing bowl. Stir to mix well. 3. Cut the cold butter into small pieces and add to the flour mixture. 4. Using your fingertips, work the butter into the flour until it has the consistency of cornmeal. 5. In a small bowl combine the milk and sweet potato and mix well using a fork or a whisk. Add to the flour mixture all at once and stir quickly just until it forms a ball. 6. Turn the dough out onto a lightly floured surface and knead 14 times. Do not overwork the dough or it will become tough. 7. Pat the dough out until it is 1/2-inch thick. Cut into rounds with a biscuit cutter or the floured top of a drinking glass. 8. Gather the scraps, pat out and cut again until all the dough is used. 9. Place dough rounds on a cookie sheet and bake for eight to ten minutes or until the bottoms of the biscuits are golden brown.